Before the Philippines discovered Brazilian Formula 1 drivers, MMA fighters, and supermodels, there were the football players led by the eternal Pele, and then... Leila Barros. Barros led Brazil women’s national team to a bronze finish in the FIVB Grand Prix held in Manila in August of 2000. The five-foot-ten opposite hitter was a crowd darling (an understatement if there was ever one) and along with the other national teams participating in the tournament, helped galvanize the sport of volleyball inspiring a generation of local volleybelles. Adachi, is the second most popular Brazilian volleyball player to have played in Manila. She was Petron Blaze’s setter when they won the Philippine Superliga Grand Prix in 2014 and led them to a second place finish in the 2015 edition. Very recently, she took part in her first beach volleyball competition in the Beach Volleyball Republic Invitational Tour alongside Rupia Inck. After watching her BVR friends in Shakey’s V-League side Bali Pure battle the University of the Philippines Lady Maroons in a thrilling five-set win, Adachi took time to explain her tweet. When I first arrived in Manila, as soon as people found out that I am Brazilian, they asked me questions like, ‘Do you know Leila Barros? What is she doing now?’ That was like music to my ears. In Brazil, she is a very important player for us. But it is just as incredible to know that she can change volleyball in another country on the far side of the globe." "I was thinking maybe I can bring Leila back and this is my gift to the Philippines,” thought Adachi. 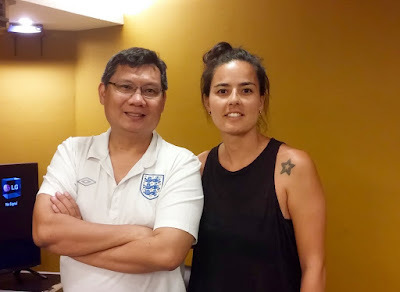 "Through some common friends, I was able to get in touch with her and learn firsthand from her about her experiences playing not only for Brazil but going to the Philippines. When I presented to her the idea of coming back here and playing for a Filipino audience, she said, ‘yes’ and was very excited." Aside from coming over to take part in the BVR Invitational, Adachi, is meeting with some people to help formalize the plans to bring Barros over. “Right now we are looking at October of this year, after the Olympics,” said Adachi. "We don’t know if it’s indoor or beach volleyball. Maybe we can combine both so we can maximize her being here. I don’t want her to come here for one event. If she can do both that would be great and we will have the best of both worlds." With regards to her returning to play for Petron, Adachi, who now resides in Michigan, USA, said there is nothing at the moment. "I don’t know yet. After I first played for Petron, I kind of knew I was coming back. This year that didn’t happen. Am not sure if Petron will invite me. But I haven’t gotten any invite yet. I am here at the moment because of BVR. Maybe it could be with the V-League. Nothing is sure yet." "One thing is sure, playing here is so amazing. I never felt so loved playing volleyball here." E aí Erika Aconteceu ou não o evento? Não vi link aqui para o evento! Perdão é Erica e não Erika! Essa com K também joga um bolão! Agora botar um homem contra as mulheres na Superliga acho sacanagem do Baurú! O que me diz!